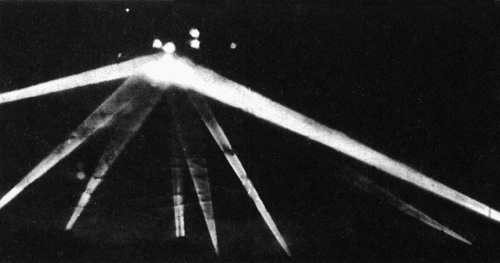 The U.S. Army anti-aircraft searchlights by this time had the object completely covered. "They sent fighter planes up (the Army denied any of its fighters were in action) and I watched them in groups approach it and then turn away. There were shooting at it but it didn't seem to matter." Katie is insistent about the use of planes in the attack on the object. The planes were apparently called off after several minutes and then the ground cannon opened up. "It was like the Fourth of July but much louder. They were firing like crazy but they couldn't touch it." The attack on the object lasted over half an hour before the visitor eventually disappeared from sight. Many eyewitnesses talked of numerous "direct hits" on the big craft but no damage was seen done to it. "I'll never forget what a magnificent sight it was. Just marvelous. And what a gorgeous color! ", said Katie. RESIDENTS AWAKENED Sleepy householders awoke to the dull thud of explosions... "Thunder? Can't be!" Then: "Air Raid! Come here quick! Look over there...those searchlights. They've got something...they are blasting in with anti-aircraft!" Father, mother, children all gathered on the front porch, congregated in small clusters in the blacked out streets -- against orders. Babies cried, dogs barked, doors slammed. 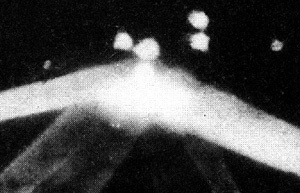 But the object in the sky slowly moved on, caught in the center of the lights like the hub of a bicycle wheel surrounded by gleaming spokes. SPECULATION RIFE Speculation fell like rain. "It's a whole squadron." "No, it's a blimp. It must be because it's moving so slowly." "I hear planes." "No you don't. That's a truck up the street." "Where are the planes then?" "Dunno. They must be up there though." "Wonder why they picked such a clear night for a raid?" "They're probably from a carrier." "Naw, I'll bet they are from a secret air base down south somewhere." Still the firing continued. Like lethal firecrackers, the anti-aircraft rounds blasted above, below, seemingly right on the target fixed in the tenacious beams. Other shots fell short, exploding halfway up the long climb. Tracers sparked upward like roman candles. Metal fell. It fell in chunks, large and small; not enemy metal, but the whistling fragments of bursting ack-ack shells. The menacing thud and clank on streets and roof tops drove many spectators to shelter. WARDENS DO GOOD JOB Wardens were on the job, doing a good job of it. "Turn off your lights, please. Pull over to the curb and stop. Don't use your telephone. Take shelter. Take shelter." On every street brief glares of hooded flashlights cut the darkness, warning creeping drivers to stop. Police watched at main intersections. Sirens wailed enroute to and from blackout accidents. There came lulls in the firing. The search lights went out. (To allow the fighter planes to attack?). Angelinos breathed deeply and said, "I guess it's all over." But before they could tell their neighbors good night, the guns were blasting again, sighting up the long blue beams of the lights. WATCHERS SHIVER The fire seemed to burst in rings all around the target. But the eager watchers, shivering in the early morning cold, weren't rewarded by the sight of a falling plane. Nor were there any bombs dropped. "Maybe it's just a test," someone remarked. "Test, hell!" was the answer. "You don't throw that much metal in the air unless you're fixing on knocking something down." Still the firing continued, muttering angrily off toward the west like a distant thunderstorm. The targeted object inched along high, flanked by the cherry red explosions. And the householders shivered in their robes, their faces set, watching the awesome scene. City Blacked Out For Hours The city was blacked out from 2:25 to 7:21 am after an earlier yellow alert at 7:18 pm was called off at 10:23 pm. The blackout was in effect from here to the Mexican border and inland to the San Joaquin Valley. 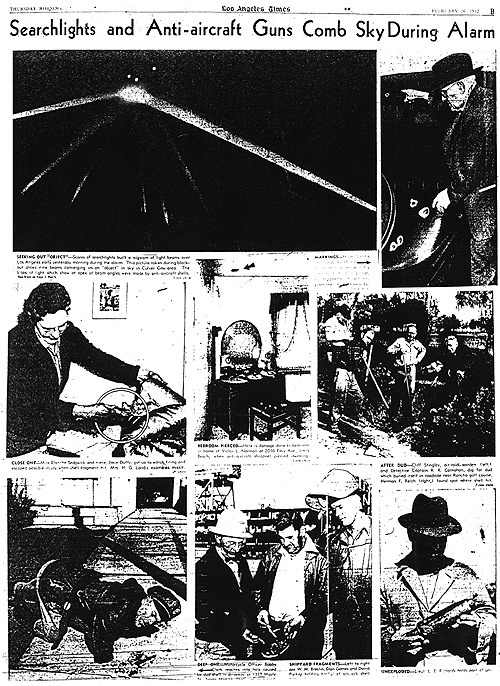 No bombs were dropped and no airplanes shot down and, miraculously in terms of the tons of missiles hurled aloft, only two persons were reported wounded by falling shell fragments. 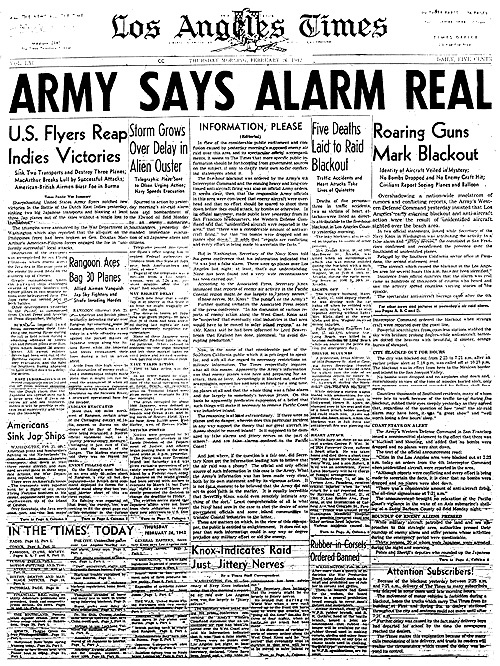 Countless thousands of Southland residents, many of whom were late to work because of the traffic tie-up during the blackout, rubbed their eyes sleepily yesterday and agreed that regardless of the question of how "real" the air raid alarm may have been, it was "a great show" and "well worth losing a few hours' sleep." The blackout was not without its casualties, however. A State Guardsman died of a heart attack while driving an ammunition truck, heart failure also accounted for the death of an air raid warden on duty, a woman was killed in a car-truck collision in Arcadia, and a Long Beach policeman was killed in a traffic crash enroute to duty. Much of the firing appeared to come from the vicinity of aircraft plants along the coastal area of Santa Monica, Inglewood, Southwest Los Angeles, and Long Beach. The firing continued intermittently until 4:14. Unexploded shells destroyed pavement, homes and public buildings, three persons were killed and three died of heart attacks directly attributable to the one hour barrage. Several persons were injured by shrapnel. A dairy herd was hit but only a few cows were casualties.